Everything in Voice Apps revolves around the concept of an Intent. An intent defines how the skill should respond to what the user says or does. It's what the user "intended" by their actions. The "Welcome" intent is required by all skills. 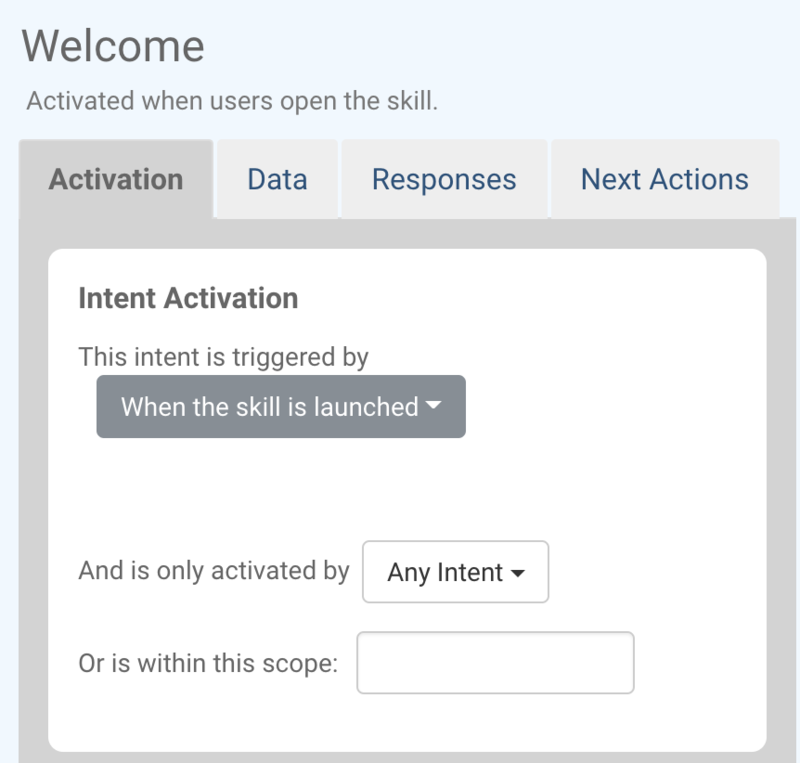 It is executed when the user first launches the skill. You can use this intent to welcome the user to your skill, let them know what it does, and give them options for what to do next. The "Help" intent is required by most skills and is executed when the user says something like "help", or "help me", or "how does this work". You should use this intent to tell the user what your skill does and how to use it. 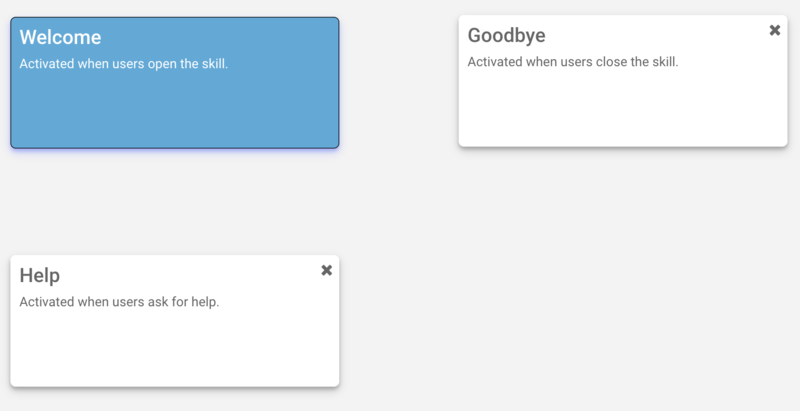 The "Goodbye" intent is also required by most skills and is executed when the user says things like "goodbye", or "quit", or "cancel". You can use this intent to tell the user "thank you" for using your skill and encourage them to return. At the right side of your project page is the Intent Settings panel. As you click on each intent in the Visual Editor, the Intent Settings will be updated with the settings of that intent. The currently selected intent is colored in blue. To change the name or description of the intent, simply click on the name or description and begin typing. NOTE: You must not have two intents in your project with the same name. You can create a new intent by clicking the "New Intent" button at the top of the Visual Editor. If you've selected an intent (other than "welcome"), you can also click the "Duplicate Intent" button to make a copy of the selected intent. This article introduced you to intents and showed you how to create them. In the next article, you'll learn about Intent Triggering and Activation.